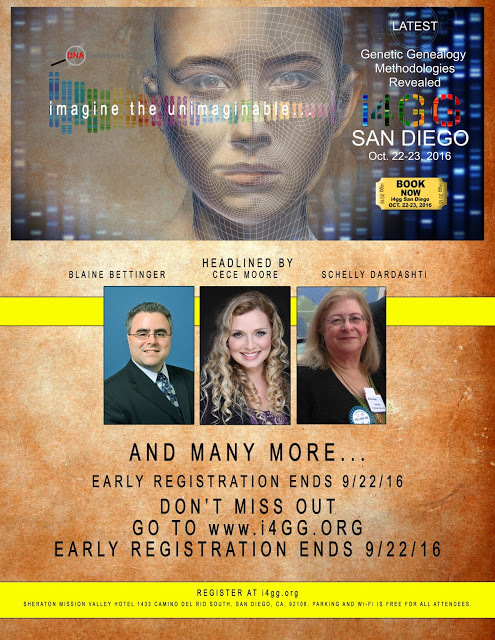 The 2016 International Genetic Genealogy Conference is coming to San Diego! i4GG was last held in Washington D.C. in 2014 and they have chosen beautiful San Diego as their next conference destination. The conference will be held at the Sheraton Mission Valley Hotel on October 22-23, 2016. They have a block of rooms set aside at a discounted rate for attendees if you are from out of town. This will be the most genetic genealogist group assembled in San Diego ever! You truly don't want to miss this historic event. Please visit the official website here for the complete info and schedule. Early registration ends today, 22 September - the prices go up on 23 September. Thank you so much for posting about our event, Randy! PS - I just saw that you have a CVGS event on the same day where you are keynote speaker. I am so sorry that we double booked. I was not aware of it. Thank you even more for blogging about our event even though it conflicts with yours. I hope some of your attendees can make it to our event on Sunday.